Our work exploring the implications of organizational culture and the link to leadership & complex life systems can sometimes seem like an impossible task. We recently discovered a few resources, through our involvement with Leadership Calgary which fit perfectly with the focus of our consulting practice. The resources focus on learning from historical examples of innovation in complex systems, and on being aware of the implications on organizational culture and people. Learning from history is also a key focus of the resources, and links to the work we are exploring with Mark Kozak-Holland. The resources outline how the airline industry’s inquiry and disciplined practices used by the National Transportation Safety Board (NTSB) could be applied to other industries – specifically healthcare – to help save lives and money. The creation of the NTSB was reliant on – and helped to foster – a massive culture shift within the airline industry, which was linked to a fundamental change in the function of leadership. 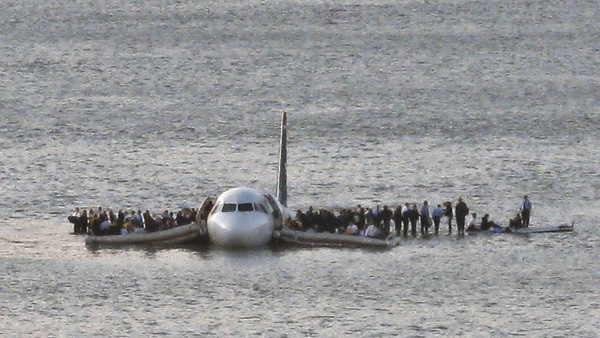 In an interview with Captain ‘Sully’ Sullenberger, famously known as the pilot who landed flight 1549 in the Hudson River, he describes how organizational cultures with leadership that act like “small g gods and big C cowboys” coupled with an emphasis on conventional notions of leadership can have deadly results. Literally. (By conventional leadership we mean formal, top-down, authoritative management.) However, a culture based on the cultivation of learning and co-responsibility coupled with notions of adaptive leadership – leadership which is primarily focused on enabling others – results in saving lives, reducing harm both physical & existential, and monetary waste. Although these resources are focused on transferring the innovation in the airline industry to healthcare we believe there is an opportunity to embed this innovation in the oil and gas industry, in areas like process safety management (PSM) and operational excellence (OE). Without leadership that enables a reliable, collaborative, learning organizational culture through trust and transparency, the organization will fall short of reaching its excellence goals – and put safety at risk. Our current work in the areas of PSM and OE are a perfect fit for this type of culture transformation. The choice seems pretty clear to us. We look forward to continuing our work to help organizations work through cultural shifts that will build their adaptive capacity through adaptive organizational culture and leadership models. FYI: if you are interested in learning about adaptive leadership and what it takes to develop the type of resiliency required for life’s most critical challenges, Leadership Calgary is currently recruiting for it’s Class of 2014, heres the link. It has been some time since we posted to our site. It’s not for lack of progress but lack of time! We are officially kicking up our social media presence and will be more deliberate to post organizational change, project and culture resources. We’ve entered the ‘Twitterverse’ and you can now find us at @calibrationinc. Our work progresses both independently and together. The strength of a joint venture like Calibra-tion is that we are able to share in our work, what we are observing, experiencing and most importantly, learning. We both apply a shared organizational change framework and work together to evaluate and improve it. Since training with Culture-Strategy Fit in 2010 we draw on their research and have begun working with clients to explore organizational culture and how it can be leveraged for successful change. Calibra-tion is also involved in the ongoing exploration of a human venture meta-framework as developed by Ken Low of Action Studies. We aim to apply it to the work we do independently and together and above all, it informs our thinking. You can learn more about this framework by connecting with us personally or by participating in Leadership Calgary or Leadership Edmonton. Operational Excellence and Process Safety: It is no surprise to find us both engaged with large oil and gas clients in Calgary, as it is a dominant industry here. We are both specifically working on operational excellence and process safety related projects. The realm of Process Safety Management and Operational Excellence provides an excellent opportunity to begin applying our change and culture frameworks to real-world organizational challenges and opportunities. Leadership Calgary and Beyond: After many years as co-chairs of Leadership Calgary, a unique Volunteer Calgary program, we transitioned to a new team and have been working on the development of a new Path Finding program which gives alumni the opportunity to continue their human venture framework understanding and build on their Year 1 Leadership Calgary experience with a community of like-minded people. PROSCI: We traveled to Seascape Resort outside San Francisco to take the PROSCI change management certificate program. This provided an opportunity for us to reflect on the integration points between our methodology and the PROSCI change management approach. Kelly Brothers: We implemented a leadership culture survey and debrief, in partnership with Culture-Strategy Fit, for the leadership team of Kelly Brothers Productions. The results of this work will be included in Culture-Strategy Fit’s upcoming book “Culture By Design: Leadership Strategies for Intentionally Shaping Culture”. Stay connected with us and our site for more information on the book’s release. Mark Kozak-Holland and Learning From History Series: We have been working diligently on putting together an outline for a book on change and project management and organizational culture, in collaboration with Mark Kozak-Holland. We are very excited to be able to draw on his expertise and leverage insights from his work with the Lessons from History series. Besides all this, Blythe was busy having baby number one, John, and is due with baby number two in November! Natalie, a self-described “health food junky”, gardens, cooks and writes for her popular food blog: Health Food Junkies. The year ahead is a busy one and we look forward to the explorations and learning! We recently had several opportunities to speak about our work in the areas of organizational change management and organizational culture. These opportunities have allowed us to share our experience and expertise with a variety of audiences. We’ve been pleased with the positive response we’ve received to date and look forward to working with those we’ve connected with over the past few weeks. Exciting times! Blythe and I are excited to announce that we will be speaking at the PMI SAC 2010 Conference in Calgary. The PMI SAC (Project Management Institute of Calgary, Southern Alberta Chapter) 2010 Conference is a professional development conference for project managers, business analysts, change specialists and the like. You can check out the conference here. We will be speaking about Using Organizational Culture and Change Management to Create Sustained Project Value and Results on November 9 from 11:00 to 12:00. Sustained organizational change on projects comes from balancing people, process and technology. Organizational change management is a creative process and includes a variety of methodologies and techniques. Change management adds value to projects and is increasingly included on project teams, improving project success, return on investment and sustainability. A key component in successful projects is understanding and leveraging organizational culture. Learn a simple and engaging culture assessment technique to kick off your project. Identify and diagnose constraining and enabling factors that will influence project outcomes. Hopefully we will see some of you there! If you do attend, please come by and introduce yourself. We had the opportunity to present our organizational change and transformation framework for the first time at Ethier Associates (www.ethierassociates.ca) on May 19. Ethier is a consulting firm specializing in project management, business process innovation and business analysis, bringing business improvement through people and technology. We highly respect their work and we were honoured when they asked us to share our ideas at one of their Learning Forums – organized for their consultants as opportunities to explore new ideas and enrich their own experience and learning. This was the perfect opportunity for us to start sharing our combined ideas for change and culture management and what building capacity is all about. We had about 20 people attend the session, including Ethier’s partners. The subject of the session was “Understanding and Leveraging Organizational Culture and Change”. We presented our change methodology, our full-specturm model of change management, and the organizational culture work we are embedding in our practice and introducing to the Calgary market. Our presentation focused on how to sustain change in organizations by focusing beyond the project to embedding change management, organizational culture practices and capacity development at all levels. 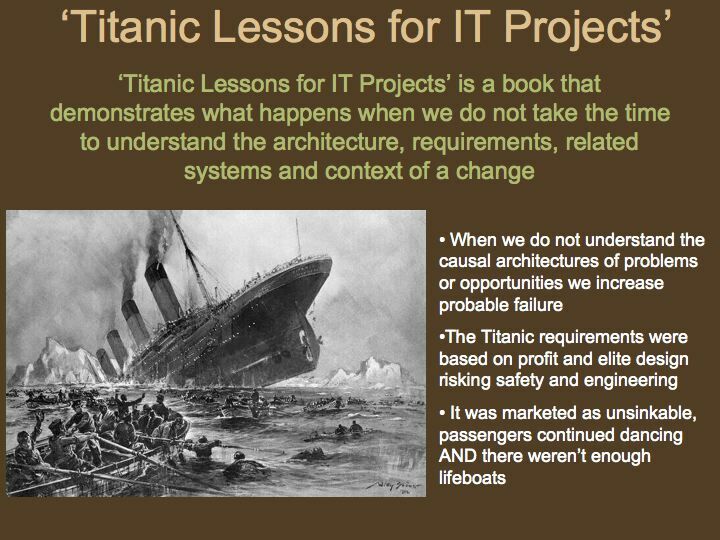 In our presentation we referenced the book ‘Titanic Lessons for IT Projects’ by Mark Kozak-Holland. The importance of understanding the causal architecture or as many factors, context and history of a problem is critical to creating long-standing and sustainable solutions. It was a great experience for us and the presentation was well-received. We are looking forward to more opportunities to present our work to other colleagues and organizations in Calgary. We’re excited about this work and want to share it! Calibra-tion aims to bring organizational change and culture management into mainstream thought and value of business. 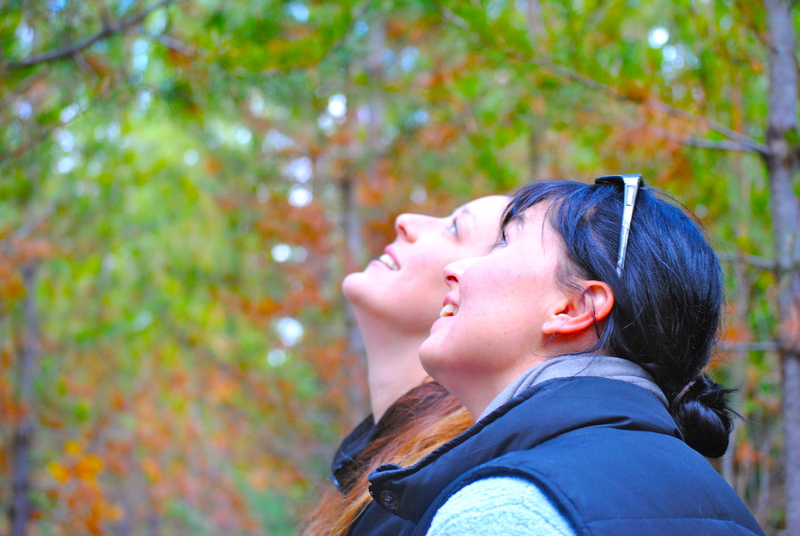 With combined experience in project and change management, leadership and strategic planning Blythe Butler (Atticus Insights) and Natalie Muyres (Breathe Consulting) look forward to working with new and previous clients. They are both passionate about people, innovation and motivating teams to build the capacities required to effectively meet the challenges and opportunities they face. We are working on content to post soon. So check back at a later date.